There are seven roughly hacked holes in this floor of scaffolding boards that we built above the existing floor. 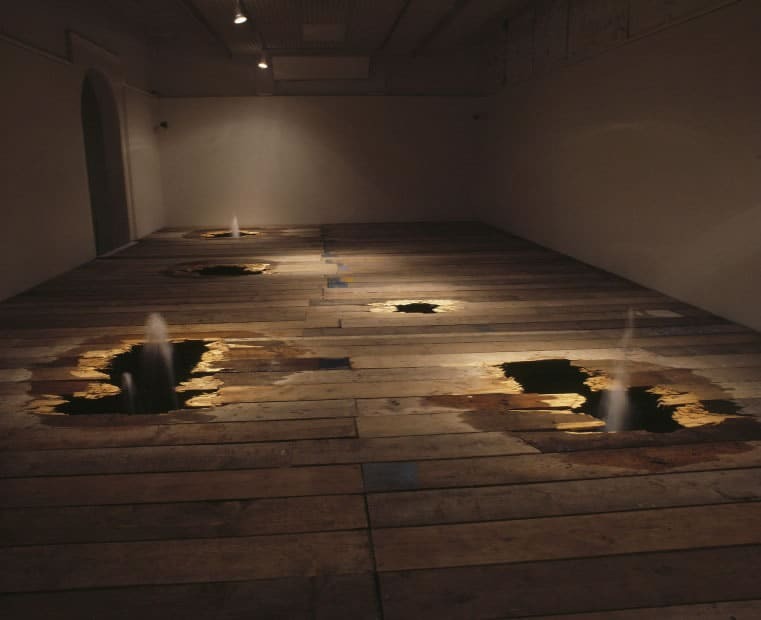 As people walk around the space, water pumps up from beneath the holes splashing on the surrounding boards . This installation was one of three with Forensic Evidence and Wreck, a suspended translucent boat shape of X-ray photographs, which were shown in sequence. This series of False Floors may be a response to a recurrent dream ~ I have of a subterranean chamber filled with dark moving water. There is a lot of water and it seems somehow ominous. The idea also comes from my interest in the Sutton Hoo Burial Ship, an amazing 26 metres long seventh century boat that was buried beneath a tumulus in Suffolk. Commission: Wolverhampton Art Gallery, Wolverhampton UK.